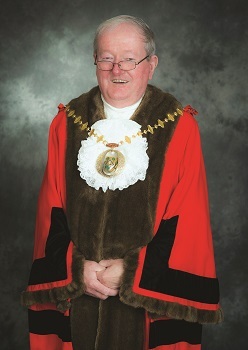 Cllr Keating is a familiar figure in the community as he has been a councillor in South Ham since 2000. 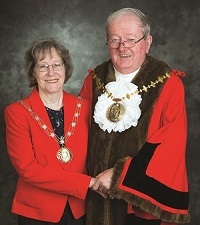 With his wife Gwen by his side as Mayoress, they are looking forward to meeting as many local people as possible and attending fundraising events, particularly those involving music and the arts. “I love talking to people, and that’s why I’m supporting three ‘people’ charities this year – Mencap, Basingstoke NeighbourCare and Naomi House and Jacksplace. Cllr Keating is particularly active in supporting local housing issues and involved in the Westside Community Centre. He was instrumental, with his fellow councillors, in getting a new Methodist church in South Ham built in 2005. He and Gwen, who had four children and have eight grandchildren, regularly attend St Joseph’s Church in South Ham. Born in Blarney, Co Cork, Ireland, Cllr Keating jokes that he kissed the legendary Blarney Stone before coming to England at the age of 17 in search of work. “And I’ve not stopped talking since,” he said. It was a chance encounter with a trade union leader while working in a coal mine in Wales that set the 18-year-old on his career path and a lifetime of looking after the welfare of others. After leaving the coalface, he retrained in engineering and worked at Perkins Engines in Peterborough where he became a trade unionist and was made convenor. In 1978, he was accepted onto a two year scholarship to Ruskin College in Oxford. From there he was headhunted to become a full-time trade union official. In 1983 he came to Basingstoke to take the role of APEX National Secretary at the AA and stayed there for 10 years. His work for the white collar union APEX then led to him being made the GMB National Secretary. At the age of 52 he retired with ill health. He then decided to indulge his passions for local politics and woodwork. He found he didn’t like woodwork so he turned his attention to serving his community as a councillor. He has taken a keen interest in local housing matters over the years. In addition, Cllr Keating sat on the board of Kingfisher housing association, predecessor of Sovereign. Mrs Gwen Keating will spend her time in office supporting her husband, attending engagements and meeting local people out and about in the borough. Gwen and Sean enjoy reading, music, looking after their granddaughter Daniela and walking the dog.